DLNR Division of Forestry and Wildlife (DOFAW) personnel and invasive species committees on O‘ahu, Maui, Kaua‘i and Hawai‘i Island conduct twice-annual overflights of native forests, where ʻōhiʻa is present in large numbers. Last week’s announcement that one of two species of Rapid ʻŌhiʻa Death (ROD), known as Ceratocystis huliohia, was positively identified as killing at least five trees in the Moloa‘a Forest Reserve on Kaua‘i has given survey teams a renewed awareness and sense of urgency. The various island Invasive Species Committees have a shared mission of stopping the spread of invasive species like Rapid ʻŌhiʻa Death. On Oʻahu, the news from Kaua‘i is prompting OISC to institute decontamination procedures whenever the crew encounters ohia forest and not just when sampling dead trees. These procedures have become commonplace on the Big Island and now on Kaua‘i. These include using 70% isopropyl alcohol and scrub brushes to get mud off boots, washing the wheel wells and undercarriages of vehicles used in forest areas, decontaminating tools and avoiding moving any ʻōhiʻa wood or wood products from place-to-place. Recently researchers found there are two different species under the ROD umbrella. Ceratocystis huliohia, the less serious of the two, recently confirmed on Kaua‘i and Ceratocystis lukuohia, which is largely responsible for the devastation of millions of ʻōhiʻa trees across 135,000 acres on Hawai‘i Island, since ROD was first identified more than four years ago. It’s not believed at this time that Ceratocystis huliohia spread from the Big Island to Kaua‘i. Since it kills trees much slower than its more aggressive cousin, researchers think it could be present in native forests around the state and have been so for a very long time. 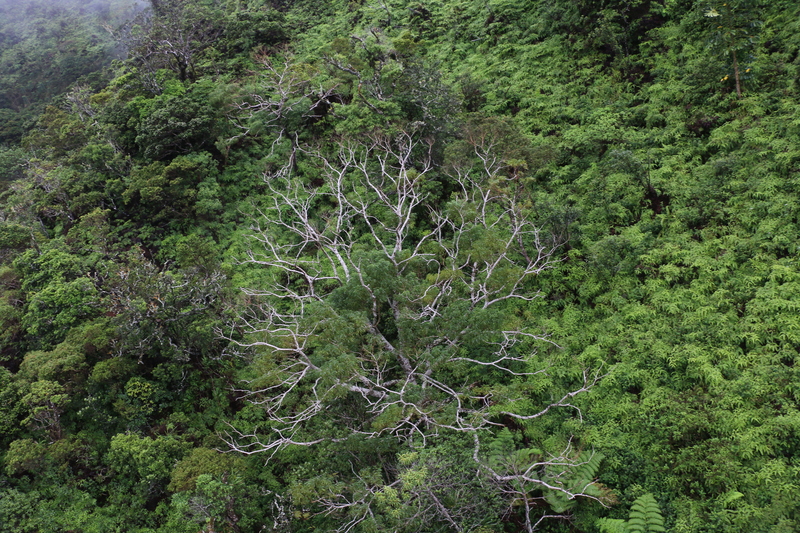 Increased awareness of what to look for by people working in and surveying in forests may be the primary reason the trees on Kaua‘i were detected and subsequently tested. There is currently no treatment for either strain of Rapid ʻŌhiʻa Death and that’s why scientists, field crews, and land managers are encouraging everyone who goes into a forest for any reason to practice good decontamination techniques. Oʻahu residents may report dead or dying ʻōhiʻa to oisc@hawaii.edu or 808-266-7994. Photos of the tree and specific locations are extremely helpful to be able to sample the tree later.